Sockett's newspaper obituary suggested that the life of a country clergyman necessarily offered little of interest. This was not true of Thomas Sockett. Born in East London the son of a Nonconformist, impoverished bookseller, Tom's youthful skill with the fashionable electrical shock machine opened up his intellectual and geographical horizons introducing him to the poet, William Cowper, in Buckinghamshire, and the writer, William Hayley, who took him to Sussex. Aged seventeen, Tom was then sent to Sheffield Park to live with the servants but to help Lord Sheffield produce Edward Gibbon's Memoirs. Two years later, with Hayley's recommendation, Tom moved into Petworth House as tutor to the sons of the third Earl of Egremont and Elizabeth Ilive. His journal, written between 1805 and 1807 - included here in full - tells of his life in the Friendly Palace; teaching the Wyndham boys; playing tennis and hunting with aristocratic French emigres; dining at neighbouring big houses; serving in the Petworth yeomanry, and finishes as he goes to Oxford sponsored by the third Earl, who presented him with the rectories of North Scarle in Lincolnshire, Duncton and Petworth in Sussex. Sockett could then get married. His family history, and demanding work as an Anglican Rector and aide to the Wyndham family, is revealed in the multitude of his letters and business papers in the Petworth House Archives. Responsible for despatching two thousand emigrants to Canada Sockett fought the stringencies of the 1834 Poor Law Amendment Act and Hawley, the Assistant Poor Law Commissioner, on behalf of his poor parishioners and appeared before three Parliamentary Committees. George Sockett, his eldest child, emigrated to Canada and it is there that Sockett's descendants have proliferated and flourished. His great-great-great grandson, Gary Wilson has contributed a final chapter on the history of George and Ruth and their children in Ontario. "Clearly destined to be a classic". "Haines and Lawson have done an excellent job in teasing out the details of Sockett's life and family. They have delved deep into the Petworth House Archives, and through a study of Sockett's own papers have produced a fascinating insight into the life of the 3rd Earl's family and household at Petworth House, and the squabbles that arose between the sons after the Earl's death. There is also much about Sockett's own two wives and children, and the Canadian connection. Although his family died out in Sussex around 1900, his eldest son emigrated to Canada and there are now several hundred of his descendants scattered around various parts of Canada and the United States. 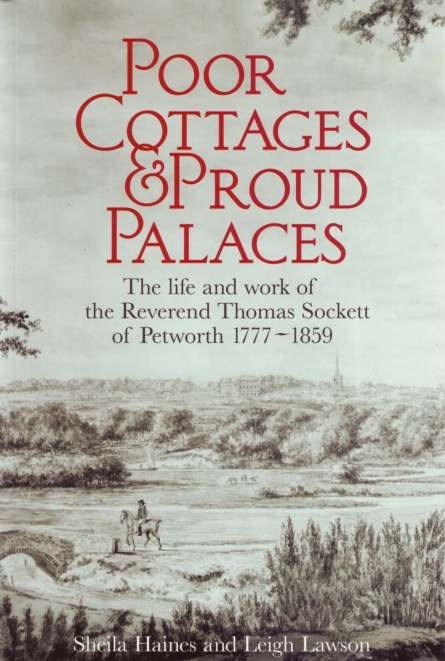 For anyone interested in the history of Petworth and the 3rd Earl of Egremont, this book is a MUST. It is well indexed, with many illustrations and a summary of all the individuals mentioned. I couldn't put it down! "This is a fascinating biography of someone who lived during a period of great change in our country side where he played such an active role. Genealogical information and family trees have been researched and provided by Leigh Lawson (by Ramkissoon at dressheadcom). The book is illustrated with many photographs, plans, journal entries etc. There is a good, quite detailed index. This book would be of interest to anyone whose forebears emigrated to Canada under the Petworth Scheme, of course, but also to anyone whose forebears lived in Petworth during this period, to anyone interested in the implementation of the Poor Law Amendment Act, 1834 from the view point of those on whom the Act was inflicted and also to anyone who wishes to know what life in a small town was really like."